This year we initiated our Street Vets Program, Sacramento’s only year-round free mobile clinic serving low income and homeless pet owners. 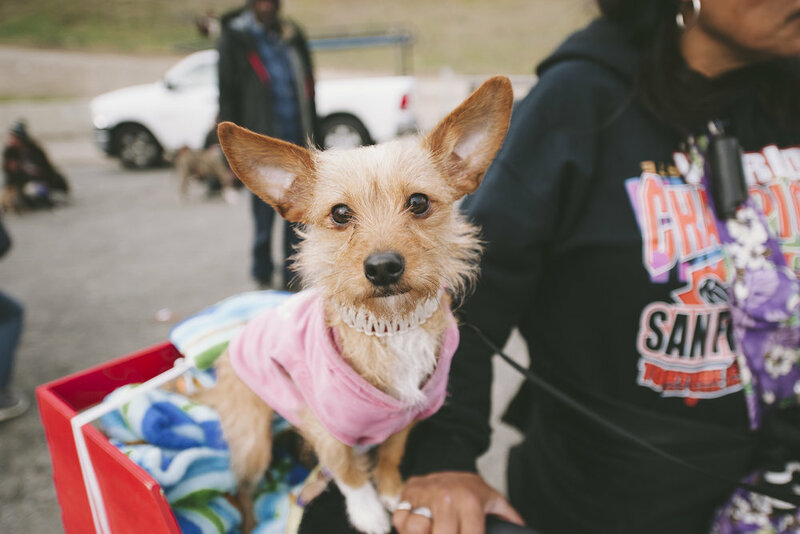 Every week, our volunteers are out in the most underserved neighborhoods in Sacramento, delivering veterinary care, supplies, and education. We care for up to 500 dogs and cats each month, most of whom would otherwise never see a vet. We administer the basics- vaccines, flea and worm prevention, collars and ID tags- to all. Others we treat for parvo, mange, wounds, even trauma after being hit by car. Each month, we help owners say goodbye to their beloved pets with mercy and dignity, providing euthanasia when no other options for either treatment or end of life care are available. We are proud of what our scrappy, resourceful, passionate Street Vets Team is achieving. But there is a limit to what we can accomplish in the parking lots and the cul-de-sacs where we hold our clinics. It has long been our goal to have a mobile medical trailer, complete with a surgery suite. With the capacity to offer full service vet care, including spay/neuter services and dental care, right to the pets and communities where the need is the greatest, we can make an unprecedented impact on the wellness and welfare of the pets in Sacramento. With your help, we can make access to full-service vet care a reality in our underserved neighborhoods. With your help, we can stem the tide of pets that swells our municipal shelters on a monthly basis. A generous donor has given us a 25 foot trailer, which we are retrofitting into the mobile medical unit of our dreams. Your contributions this Big Day of Giving will help make our big plans a reality. Every dollar you contribute goes toward our Street Vets Program goes toward medical supplies and equipment. You can make your contribution online anytime between today and 11:59 pm, Thursday May 3. Thank you for being part of our Big Plans this Big Day of Giving, and for helping make Sacramento a better place for its pets and their owners. *Note: Contributions made with through Golden 1 Credit Union will earn bonus dollars for us.